Successfully Added Wireless LAN USB Dongle - IEEE802.11g Wireless Transmitter to your Shopping Cart. Wireless Internet USB Adapter - Wi-Fi Dongle (54Mbps). With the global emergence of Wifi technology, the importance of staying connected in a modern world has never been so important. 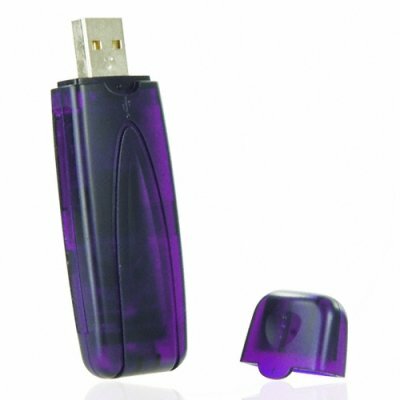 Utilizing the global 802.11G wireless standard, this LAN USB Dongle levels the playing field for you and allows all computers, no matter how old, to benefit from the ability to use and harness wireless technology. Easy to install and effortless to use, simply install the software and then plug and play - insert the dongle into a USB port, that's all there is to it! Avoid the need to buy a new computer or go through the hassle and cost of upgrading your existing computer, whether at home or at work. Enjoy the benefits of wireless technology around the home to relax and surf wherever you are inside. Receive a steady productivity boost while you work with the ability to join a wireless network indoors or connect to a hotspot or AP (access point) while relaxing outdoors. Increase your surfing speed and improve the signal range to your computer. All of this is available to you now with this great USB device. Simple use low cost thanks.